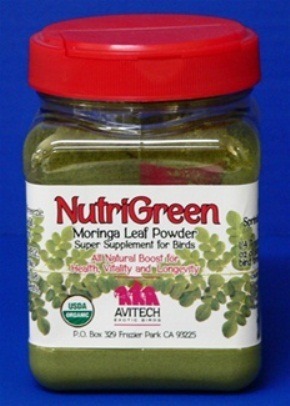 Moringa leaf has been called the world's must nutritious green and NutriGreen is an easy way to provide its benefits for your bird. It's in a convenient powder form and with its wealth of vitamins, minerals, and amino acids, Moringa leaf is an ideal all-natural nutritional supplement. NutriGreen is certified organic Moringa leaf that has been freeze dried and powdered. Freeze drying avoids the high temperature processing that can degrade nutrients in the leaf. NutriGreen is all human-grade and contains no twigs or other debris. Moringa leaf has been called the world's must nutritious green and NutriGreen is an easy way to provide its benefits for your bird. NutriGreen is certified organic Moringa leaf that has been freeze dried and powdered. I sprinkle into eggfood:) One 4 oz left!